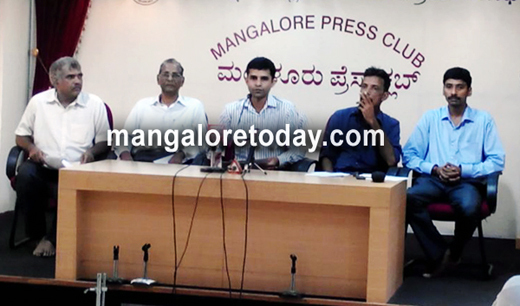 Mangaluru, May 19,2015: The Rashtriya Parisara Samrakshana Okkoota has strongly opposed the plans to shift the Deputy Commissioner’s office of Dakshina Kannada to a new location. Speaking to reporters here, Daniel Tauro of the Okkoota has said that the DC office of the district is presently situated in a very ideal location on a nine acre expansive area and has all the facilities. Any move to shift it to Padil is nothing but a ploy to waste government funds, he alleged. Continuing, he said there has been no complaint so far by anyone that the present DC office location is inconvenient. The issue of shifting the DC office to Padil was discussed at the progress review meet without taking anyone into confidence, he alleged. Tauro further stated that the DC office can be shifted only after the cabinet approval. Pointing out to the fact that several protests are being held in front of the DC office here, he said that it would however not be possible if the office is shifted to Padil as it is a Highway area. Moreover the land where the DC office is proposed at Padil belongs to the Forest Department and has 478 valuable trees. There is a need to conserve this deemed forest area as a DC office here would mean that the trees here will have to be axed, Tauro said. Tauro also stated that a writ has been filed in the court pleading against shifting the DC office. Dinesh Holla, President of the Okkoota, Shashidhar Shetty, Secretary, Kateel Dinesh Pai and others were present.